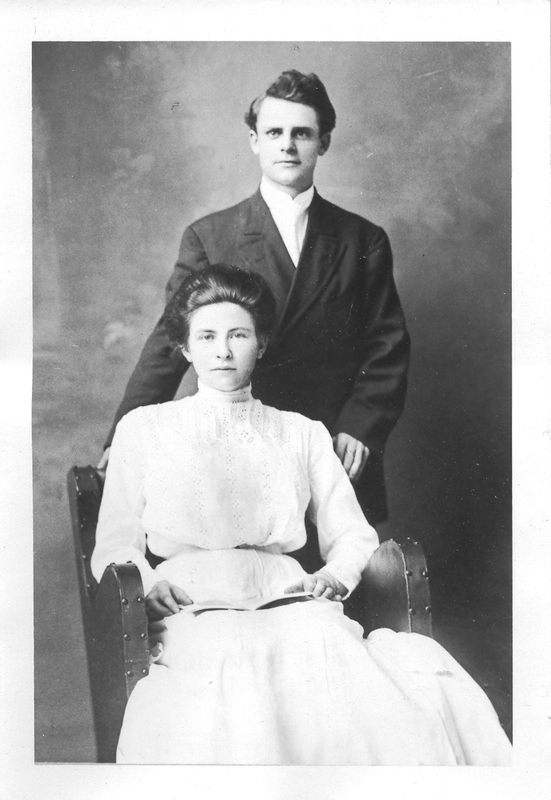 My maternal grandmother, Lucille Edna Mulder (Zuidweg), who was born in 1912 at the time of the Titanic disaster, was raised on a farm in Caledonia, Michigan. If you’ve read my blog for any length of time you know that I have a beautiful scrapbook which she made to commemorate her high school graduation in 1929. You’ve met her parents, Charles and Clara (née Waldeck) Mulder. I’ve shared with you the book collection and gavel which belonged to my great-grandfather Charles. I have not said much about my great-grandmother Clara. What I know about her is that she raised five children on a farm in Caledonia. Clara’s parents and older siblings were born in Germany (and perhaps at least one sibling in Kentucky, but don’t quote me on that). She was born August 31, 1884, in Michigan. She died September 6, 1953, of uterine cancer. I was born less than two years later. I have an Eastern Star ring which belonged to her, so I know she belonged to that organization. I had a sapphire bracelet, which I lost at my first job and was heartsick over, and a couple of other small items. I wish I knew more about Clara and her life. I think if I keep researching I will find more and maybe I will be able to put some pieces together. Maybe my mother and her siblings and cousins remember their grandmother and can add to my paltry information! Hint hint. Don’t you just love the old calling cards?? Wonderful. They are a reminder of a different era, for sure. I love visiting historic homes and seeing the tray with a smattering of calling cards. Luanne, I have the same longings as you do–to learn the truth and to reconnect. The most amazing things can happen when we sincerely remember these things each day and from the heart send out a call to bring that truth back home to us. It sounds almost mystical and to me it is. Others may call it “being on to something” or simply “reaping the rewards of diligent research”. There is something special, though, in the way certain events bring facts and truth to light. Keep your vision clear and the answers will come–eventually. I know very little about the Masonic Orders and their affiliated associations, but it might be good to research their signs and symbols and practices. Keeping these things in mind may likewise draw your attention to other clues that could lead you in a direction to learn more about your ancestors involved in these groups. I find the 19th and early 20th century Masonic stuff fascinating. I’ve read at least one book about the history. You are so right about certain events bringing “facts and truth to light.” Beautiful words, EmilyAnn. One thing I know about Eastern Star is that in the 1960s a female Eastern Star had to be a sister, wife, daughter, widow, or mom of a Mason. Men can also join the Stars. Freemasons are required to believe in a Supreme Being, but who that is isn’t specified. (Mostly Protestant girls and a few Jewish girls belonged to the Rainbow Girls (a Masonic group for girls) in my town in the 1960s. Catholic girls did not join because Masonic groups are secret societies.) Buddhists, Christians, Hindus, Muslims, Jews, Sikhs, etc., all number among the Masons. Also, I wonder about your relatives who actually were in the building trades. Masonic membership seems a natural for them as the organization was founded in the Middle Ages by a guild of stone masons. Wilma, that’s great info. I didn’t realize for a long time that Eastern Star was a Masonic organization. I was fascinated by the Masons before I realized this. I can sense how you felt when the bracelet was lost. I have many crumbling documents–and I always feel devastated when I inadvertently tear one when I’m trying to very carefully handle it. Ugh, I still remember that moment vividly, looking down and seeing it was gone. Then hunting everywhere I had been in the department store I was working in. I had no idea that the latch wasn’t secure. I know what you mean about being so careful with crumbling documents. Feeling like you’re part of the aging and deterioriation is painful.